Home Facebook How to know your Facebook Account creation date? How to know your Facebook Account creation date? There is no doubt Facebook is a #1 social network which is gets 1 billion active users through World wide. 44% of internet users using Facebook to connect with their friends. Do you know when you created a Facebook account? 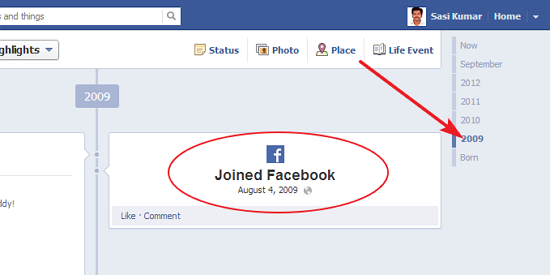 Using Facebook Timeline, users can know the exact creation date of their account. Here below the simple tutorial to explains how to know your facebook account creation date. Like this way you can find your Facebook Account creation date.